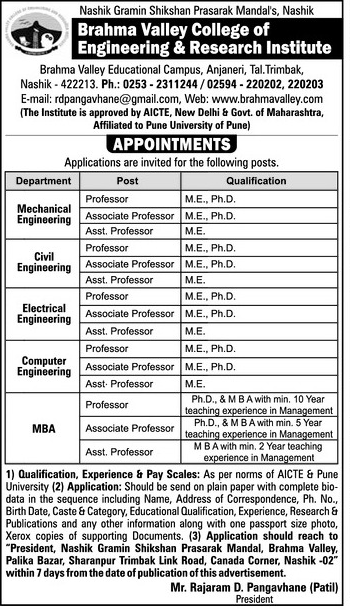 Brahma Valley Collage Nashik (Brahma Valley College Of Engineering And Research Institute), Nashik published a new job notification for Professor, Associate Professor & Assistant Professor Posts. The willing candidates are informed to see the latest notification March 2019. Last Date of offline application is 23-03-2019. For More details of Brahma Valley Collage Nashik Recruitment 2019 Read Below. Interested & Eligible candidates can send their application along with all the necessary documents and testimonials to President, Nashik Gramin Shikshan Prasarak Mandal, Brahma valley central Office, Palika Bazar ,Near Railway Booking Office, Sharanpur-Trimbak Link Road,Nashik-422002. Application starts offline 16-03-2019. Last Date of application is 23-03-2019.